MECH 2 is a carefully designed engineering curriculum aimed at developing student’s analytical, practical and design skills in Mechanical Engineering. We believe that the traditional curriculum is not an optimal way to educate all students and that many students will benefit from the unified approach of MECH 2. The goal of MECH 2 is for students to be able to use their knowledge and skills to apply engineering science to practical engineering problems. The most obvious difference between MECH 2 and the traditional program is the integration of course material in MECH 2 and focus on application of theory. In order to accomplish this, we have had to completely change the way courses are scheduled over each day and over the term. You will see in the weekly schedule that your life in MECH 2 will be very different from that of your friends in other programs. We are very pleased that MECH 2 has also been recognized locally and internationally. The MECH 2 Program received the Alan Blizzard Award from the Society of Teaching and Learning in Higher Education. The award was established to “encourage, identify, and publicly recognize those whose exemplary collaboration in university teaching enhances student learning. The Award seeks to make visible and disseminate scholarship of teaching and learning, based on values and practices of collaborative teaching,” (Alan Blizzard Website). In 2005, MECH 2 received the prestigious American Society of Mechanical Engineers Curriculum Innovation Award for demonstration of significant advancement in engineering education. In 2006 MECH 2 received the UBC Alfred Scow Award for providing a significant positive impact on student life and development at UBC. MECH 2 starts a week before the regular term 1 begins, meaning students must be available and in class during the first week. MECH 2 begins early due to the limited class time in the regular semester; in order to complete all of the projects for MECH 2, the introductory workshops get pushed forward, and MECH 220 starts early. This makes the first week extremely important, as without it you cannot finish MECH 220’s workshops and will therefore fail the course. Failing MECH 220 prevents you from continuing in MECH 2. Additionally, several important assignments, like your day 1 quiz, take place during the early first week. In MECH 220 you learn all of the skills required to take you through the development and building of a small project. You will complete four one-week modules that include training in machine shop practice, engineering drawing, computer aided design and analysis, and instrumentation. At the end of the four weeks, you will have modeled, documented, fabricated and tested your own fully-working, electronically-controlled magnetic levitation (MagLev) device based on a design that we will supply. MECH 221 includes more formal training in solid mechanics and rigid body dynamics. The mechanical, materials, mathematics, and electrical aspects relating to solid mechanics and dynamics will be delivered in an integrated fashion by a team of instructors. The material will be covered through a series of lectures, labs, computer labs, field trips, problem sessions, and question/answer sessions. MECH 221 will conclude at the end of first term. MECH 222 covers material in fluid mechanics, thermodynamics and mathematics. As with MECH 221, the material will be provided by a team of instructors through lectures, labs, computer labs, field trips, problem sessions, and question/answer sessions. MECH 222 will take place in the middle of second term. MECH 223 is the design course and it is split into two segments which run for four weeks after the completion of MECH 221 and for three weeks after the completion of MECH 222. In MECH 223, you will complete two design projects relating directly to the material from MECH 221 and MECH 222 respectively. MECH 223 will also include a series of lectures and labs focusing on engineering design and professional practice. At the end of each segment of MECH 223, you will have designed and fabricated a mechanical device with a group of other students. You will then have an opportunity to demonstrate your device in a competition with the rest of the class. In addition, you will prepare professional quality engineering reports and presentations as part of the design module. MECH 226 and 227 are courses in technical communication. They focus on developing the written and oral skills required to be a professional engineer. In MECH 226 and 227 you will learn how to prepare design reports and business correspondence effectively and practise your skills in verbal, online, and visual presentation of technical material. While both courses cover technical communication, MECH 227 focuses more thoroughly on linguistic structure and style. Students are placed in either MECH 226 or 227 based on their level of English. MECH 226 runs through both term 1 and 2, while MECH 227 takes place during the second summer term following Mech 2. 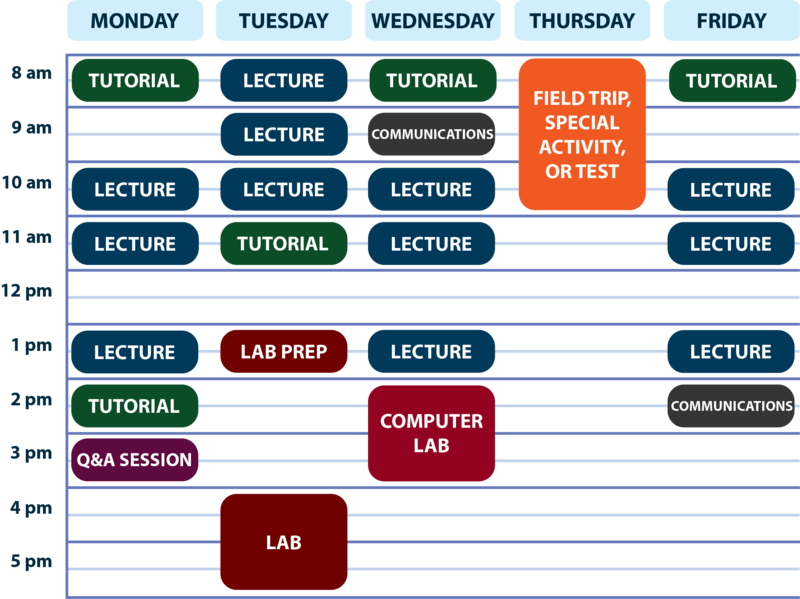 To see what a typical week would look like in MECH 2, take a look at the schedule below. One of the first things that you will notice is that you have no more than twelve hours of regular lectures per week. You will also see that Thursdays have a field trip, guest lecture or other special event but are otherwise open. There are one or two labs per week that are directly coordinated with the lecture material. You will notice that there is a lab tutorial before you perform a lab so that you will know exactly what to expect when conducting experiments and how it relates to the lecture material. The other activities include one computer lab each week and numerous tutorials to give you plenty of opportunity to work through problems and ask questions. There is also a dedicated question-answer session where you can have contact in small groups with instructors. In the second term, there are two tutorials on technical communication (MECH 226) each week – in the first term, these times are free for you to use as you see fit. Other than lectures, all activities are done in small groups of four to thirty students. †EFFECTIVE 2019W: MATH 253 and MATH 255 are no longer accepted to fulfill the Math requirements of the Mechanical Engineering program. All Mech 2 students will be expected to complete MATH 254 and MATH 258. As a leniency during this transition, we will still accept prior credit for MATH 253 or MATH 255 (or equivalent) from students who completed these course(s) before April 2019, however, students are still fully responsible for the Math course material in Mech 2. Any credit for MATH 253 or MATH 255 (or equivalent) obtained after April 2019 will no longer be accepted for credit and students will need to register and pay tuition for MATH 254 and MATH 258 in their Mech 2 year. Please see Registration & Advanced Credit for further details. As a result of the cross-faculty nature of Mech 2, MATH 254, MATH 258, and MECH 226 (or 227) appear separately on your registration. Apart from this small administrative difference, these courses are completely integrated into Mech 2 in terms of both delivery and marking. Also, when you register for a standard timetable in Mech 2, you will automatically be registered in the Mech courses and Math courses. 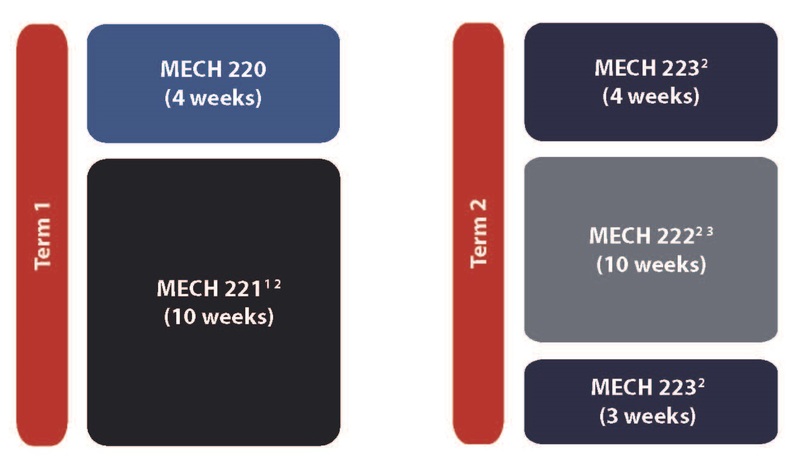 MECH 226/227 registration is handled differently – please see the Mech 2 Academic Policies and Procedures manual on the Mech 2 Connect site for details.